The lower back muscles provide support and movement for the spinal column. They also maintain our upright posture and provide a huge diversity of physical abilities to the human anatomy. All the muscular tissues of the dorsal region work closely with one another and are mutually-dependent in many ways. If one tissue is very strong, it will help weaker tissues to perform their tasks. However, deficiency in important muscular structures can negatively influence the overall functionality of the entire dorsal musculature. The back muscles in the lumbar region are often involved in numerous different lower back pain expressions. These pain syndromes can be created in the muscles due to injury or ischemia or might simply be expressed in the muscles due to innervation problems, circulation problems or other causes. Regardless of the mechanism involved in sourcing muscular pain, the results can be agonizing for the patient. 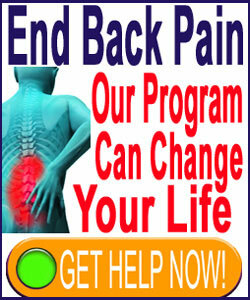 Lower back muscle pain is the most common and one of the most painful of all low back ache problems. This background essay provides a scientific look at the various structures that compose the lower back muscular anatomy. We will detail what functions these tissues perform and how they work together to accomplish more than any could accomplish as singular structures. Science has long known that the lumbar and buttocks muscles are some of the strongest in the human body. The low back muscles, including the buttocks muscles, are postural muscles. This means that they are actively engaged at virtually all times when standing or seated in order to maintain our upright anatomical posture. This task takes great strength and endurance, since these muscles must work continuously during all of our waking hours. The lumbar muscles also have many other jobs, as well. These tissues provide the ability to flex and extend the lower end of the spinal column, allowing us to bend forward deeply at the waist and even bend backwards to some degree. In complementary function, the lumbar muscles also allow us to flex at the waist, moving our torso side-to-side or in a circular pattern at the hip juncture. The lumbar muscles support the spine and help to keep the curvatures in place, as organically designed. These muscles also must provide strength for many of our physical exertions. Lumbar muscles are involved in all of our lower body movements, including walking and running, as well as most of our upper body movements, including lifting and carrying objects. The muscles or the lower back are not independent of interaction with other tissues. 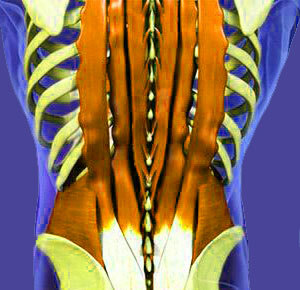 In fact, the entire musculature of the back is interrelated and inter-dependent. The lumbar muscles work closely with the muscles in the buttocks and upper leg for some tasks. The lumbar muscles work closely with the muscles of the middle and upper back for other tasks. However, the lumbar muscles connect to far more tissues than just those that directly border the lower back anatomy. The lumbar muscles work along side the hip and leg muscles for many lower body movements. The lumbar muscles are connected to the neck muscles and are activated when the neck extends or flexes to a large degree. The lumbar musculature also works with tissue groups on the sides and front of the body, including the obliques, abdominals and lower chest muscles. Back muscle injury or imbalance can have wide-ranging implications for form and functionality. This is logical given the extent of interaction between the various muscular tissues in the anatomy. When injury occurs to the lumbar muscles, such as in the case of common strain, the buttocks, legs and abdominals are often affected. Similarly, when the obliques, abdominals, mid or upper back muscles are injured, the lower back muscles will also suffer functional loss. Imbalances occur when a matched opposing set of muscles, called an antagonistic pairing, is out of balance with each other. One set of muscles is required to move a body part one way, while the other set is required to perform the opposite action. This is easily visualized with the idea of bending and straightening the leg, for example. Imbalances occur when one set of the antagonistic pair becomes to strong in comparison to its matches opposing set. The strong set will pull the weaker set of its typical alignment and make the tissues very tense. This tension can cause pain and susceptibility to soft-tissue injury.